Well hello and welcome once again dear readers and a big hello and welcome to my latest follower AND employer, Suffolk Wildlife Trust. Yes, this week I got the spiffingly jolly news that I am now the new member of the Visitor Centre Team at Lackford Lakes, Suffolk. It's only a part-time post, but is still very challenging and rewarding and I can't wait to get started. Guess where I've been this week? What's this? More stardom I hear you cry! Not really, just been at The Latitude Festival working with SWT teaching kids about bugs and hedgehogs and wood whittling. The weather was a scorcher and it only rained at night with some fantastic lightening displays rippling across the skies. At one point, whilst doing my duties encouraging people to come in and take part in some activities I said hello to a lady and asked how she was and it turned out to be no other than Kerry Godliman of Derek fame. Turned out her child wanted to show her one of the activities she had completed in a nearby tent. Craft activities under the star shade next to the willow hedgehog. So not exactly rubbing shoulders, more just saying hello really. But anyway, I digress. The weekend went along wonderfully with lots of kids bringing me there bugs to ID with lots and lots of woodlice turning up. In fact, I don't think a single bug hunting pot came back without a woodlice in it. But still, to the kids they had found something interesting and that's what it was about, teaching the kids something interesting about the bugs they had found. But it wasn't all woodlice and slugs, oh no, there was some more impressive finds too such as this lovely Longhorn Beetle. Leptura rubra, a most impressive looking beetle. One child also managed to catch this lovely large moth and was so pleased he had done so. Telling the kids all about the insects they had found and what the insects roll in the grand scheme of things was is great. They're amazed when they find out that the beetle or moth they just brought me has been living underground for most of the winter and then digs its way out come summer. Or that a woodlice sits deep within the dead wood of a tree munching away at it. It opens up a whole new world to them and hopefully ignites an interest that will grow like a fire within them. So, as you see, I've been pretty busy this week, but I was lucky enough to record the following sequence with some Small Tortoiseshell caterpillars I came across recently. Such an amazing experience to actually see these emerge right before your eyes as I did whilst recording this. I look forward to coming across more caterpillars/pupae on my travels so I can record their lifecycle as capture that which is often less seen. Currently, as I write this, I've just had some Eggar moth eggs hatch and am trying to record a time-lapse of more emerging, so watch this space. Yes, I've been out and about looking for some bats and I thought I'd give a new site a try to see what turned up and I not only got more than one surprise. A site I been to a few times and isn't very far away from me is SWT's Newbourne Springs Nature Reserve. It's where the seaside town of Felixstowe originally got its water supply from, but is now just a lovely wooded valley with a marshy meadow running through the middle of it. The stream that trickles through is lovely and clear and is a place where I've seen sticklebacks fight over territory, it's where I did my Big Butterfly Count last year and counted over 100 butterflies in 15 minutes and it's where I came across the bird box which had been taken over by hornets, the defunct hive is now used by SWT as an educational tool. So as you can see, it's a very biodiverse site and I thought I'd go see what bats I could find. Now this got me thinking, either the owner was a forgetful person who maybe stopped to tie a shoelace and then wandered off home forgetting their need for a walking stick or, were they so enthralled by the beauty of the site that their pains became the least of their worries and they wandered off in tranquil bliss? The only other thing that could've happened of course was that they paddled in the ankle deep water and were cured!!!!! Does Newbourne Springs have healing properties???? Could it be the new Lourdes right here in sunny Suffolk???? Who knows, if I hear or see any more evidence of healing, I will keep you informed. My next surprise came just around the corner when I picked up a bat I hadn't recorded before. It's call pattern looked very different from the usual bats calls and I stood and recorded a few passes before moving on. Recordings in the bag, I ploughed on round the site only for my torch to give up halfway round, not good. I stopped in a clearing to catch my breath in the warm muggy air when from my left a large black shape appeared in the corner of my eye and let out a ear piercing screech with wings spread wide! Thankfully, before my heart came to a complete stop, I realised it was a Tawny owl which I had obviously spooked and it was getting it's own back. Touché, it worked and that was definitely one up for the owl. I continued round the rest of the site without recording much else and when I got home, I was eager to find out what I had recorded. Turns out the strange call I had never heard before was that of a Barbastelle Bat. A bat that was not blessed with looks as each of its eyes are located inside their ear! Yes, the outer rim of their ear swoops round the face encompassing the eye, quite strange, yet they are still amazing and I will always remember coming across one of these during my bat rescue days. I had t take it down to Harlow to see if it could fly well enough to be released. Essex Bat Group have a flight rehabilitation cage which is ideal for this and I have never seen anything fly so beautifully in my life. It really was amazing to see. However, the final surprise came when I checked the NBN Gateway records. The bat had never been recorded at this site before! Excellent news and really was the icing on the cake for me. that night I went to bed a very happy man. Often, people say too me, 'I've had a bug hotel up in my garden for years and nothing's been near or by, load of rubbish!' The first question I usually ask is, where is it located? That's the most important thing about any animal housing, whether it be a bird box, bat box or bug hotel, it's all about location, location, location. Bug hotels, especially the ones with drilled holes or bamboo canes in them like a bit of sun, but not too much sun. Th bugs inside need to stay warm, not cooked. I have two bug hotels in my garden, one is on an east facing fence panel, the other a south facing shed side. The one that faces south is empty, but the east facing one is getting filled up nice and slowly. So if anyone tells you they don't work, they're wrong and here's a little video I took to prove it. Well that's about it from me this time. Sorry it's a short one, but as you see, been busy of late. However, fear not, as the weather warms up more and more things are happening and I hope to get to see and share more of it with you. 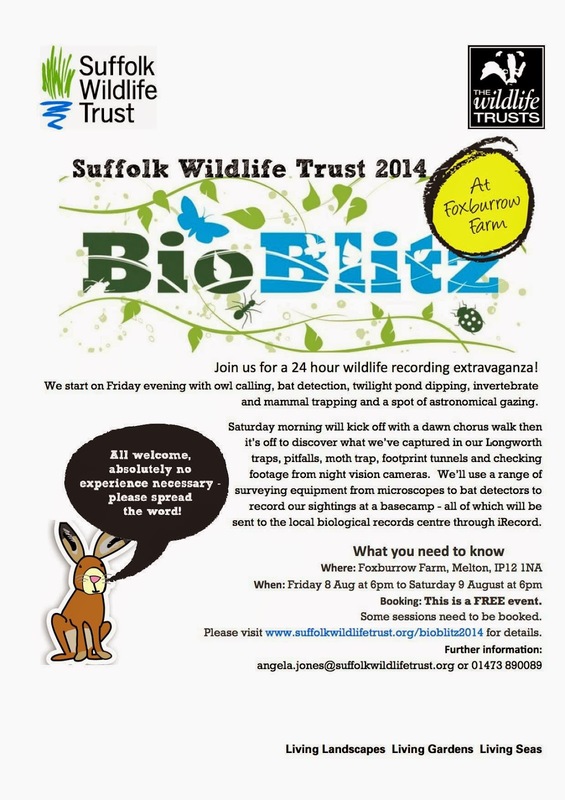 In the meantime, don't forget the Bioblitz at SWT's Foxburrow Farm on the 8th & 9th of August where I will be doing a bat walk on the evening of the 8th. It's a free event, but the walk will need to be booked in advance. Till next time dear readers, keep safe, keep smiling.